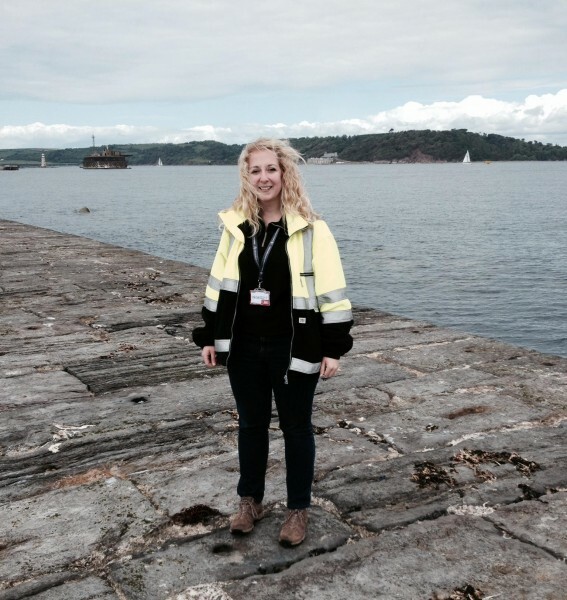 Hi, I’m Hannah Palmer, a DIO Area Utilities Manager. I’m responsible for managing utilities at Her Majesty’s Naval Base (HMNB) Devonport, in Plymouth. I also look after utilities at other local sites, including Okehampton Camp and Britannia Royal Naval College. I analyse data and investigate energy usage at sites and look into how targets are being achieved. I also engage with various interested parties, such as service personnel and Industry Partners, to raise awareness of energy use and kick-start behavioural change. Plymouth Breakwater is another of the sites I am responsible for and a few months ago, when an opportunity for a day out arose, I jumped at the chance. 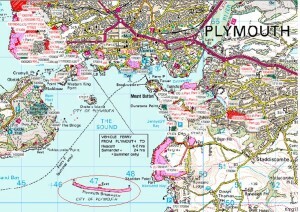 Plymouth Breakwater lies at the mouth of Plymouth Sound and protects anchorage within the Sound as well as the harbour. It is almost a mile long and lies 2 ½ miles out from Plymouth Hoe. Construction began in 1812 and wasn't completed until 1841. In order to keep the Breakwater in good condition there is a programme to sink 100-tonne concrete blocks on the far side in order to soften the impact of the Atlantic. The blocks are forged nearby at Oreston and transported into position – approximately 12 are made and sunk annually. All this made it a bit different from my usual site visits! The purpose of the trip was for a routine survey of the Navigational Aids (Nav Aids) in the Sound. We all wanted to identify any damage that may have occurred to the Breakwater during the storms earlier this year. 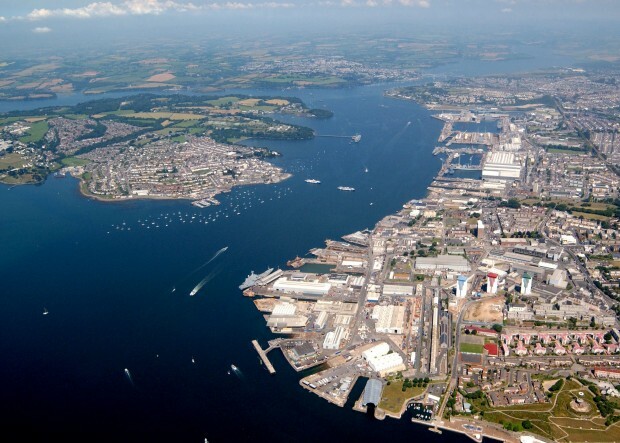 The Nav Aids are vital to guide shipping, including Royal Navy vessels entering and leaving HMNB Devonport, which makes them DIO’s responsibility. Without them, the Navy would have a much harder time accessing its own base so it’s essential that they are kept in good condition. Over the past couple of years, all the Nav Aids have been fitted with solar panels, as they are seen as a more reliable energy source than electricity in remote spots – and solar power is also great for energy efficiency. Whilst on the Breakwater, I was told that during the storms, two 100-tonne blocks were lifted and thrown over the 20ft wide stone wall and another had landed on top, demonstrating the strength of the sea. The high Spring tides and relentless stormy weather meant that the Breakwater could not protect the Sound. This led to waves crashing on the Hoe Foreshore in a way that hasn’t been seen for many years. Properties and businesses were destroyed. 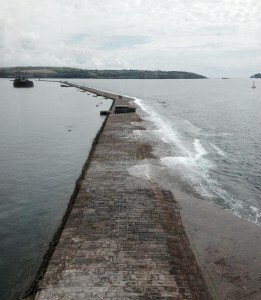 The storm highlighted the importance of the Breakwater as without it storms of less magnitude would also have an impact on Plymouth’s coastline. Whilst on the Breakwater, I also had the opportunity to explore the lighthouse. Once at the top, I was surprised to see the tiny bulb that provides the light. The external glass strips surrounding the bulb reflect the light so well that only a small one is required. The only energy required on the Breakwater is electricity to supply the light. This trip was great in helping me to understand one of my sites, albeit a small one. It was also a good opportunity to meet and network with other interested parties within the Dockyard. These included the Dockyard Health, Safety and Environmental Managers for both our industry partner Babcock Marine and the Ministry of Defence. I see these people as key individuals colleagues that I need to work with within my utilities role at Devonport.